As a guide to your age category - if you were born in 2003 - U8, 2002 - U9, 2001 - U10.......1996 - U15. 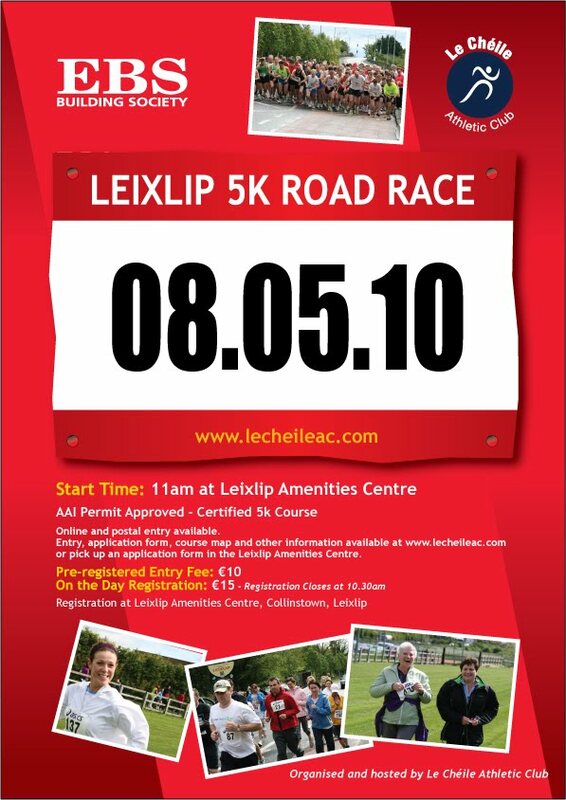 We are delighted to announce that the Le Chéile 5k Road Race has been launched this year and promises to be a bigger, better event. We received great praise from last year's event from both experienced club runners and also first timers. We are also delighted to acknowledge the support of EBS Building Society Leixlip for their generous sponsorship of the event. The race takes place on the 8th May at 11am. The cost of the race will be €10 in advance either via Run Ireland (here) or by postal entry (here). Registrations will be accepted on the day but will cost €15. 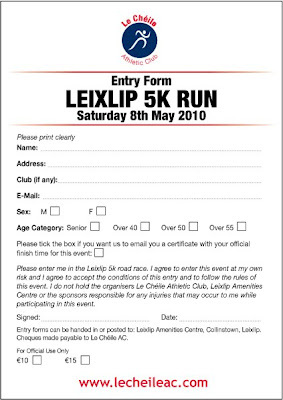 Prizes will be awarded for the 1st,2nd and 3rd male and female with category prizes going to the first male and female in the 40,45,50 & 55 age categories. The race starts outside the Amenities Centre and finishes with a lap of the Le Chéile AC track, behind the track. (The actual course and elevation are available here). Last year's results can be found here and there is a range of pictures from the 2009 event here. Do come along to this AAI permitted, certified 5k race in a friendly and welcoming atmosphere. 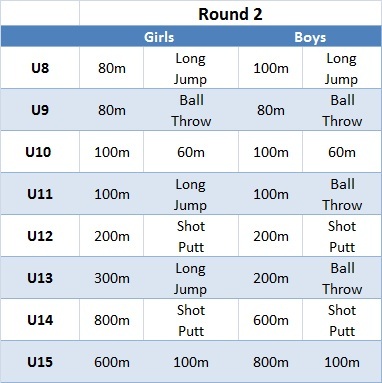 This year we have made a number of improvements including Timing Clocks that will be provided by Red Tag Timing. We look forward to seeing you all and maybe you will hang around after the race for a cup of tea, a bun and a chat.